An image of the all-new 2020 Land Rover Defender’s interior has surfaced on Twitter, posted by Twitter user @rcdesignsuk. The pic shows the dashboard design of the next-generation Land Rover Defender, which is set to be unveiled towards the end of the 2019. 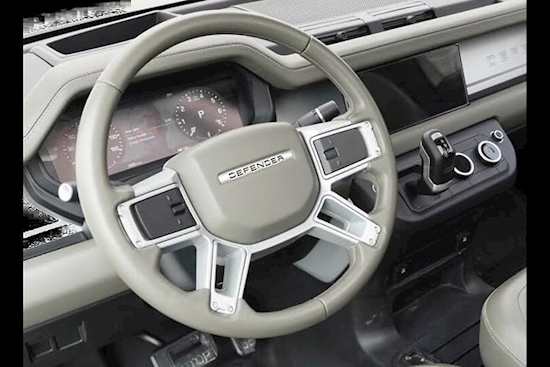 Revealing a four-spoke multi-function leather-wrapped steering wheel, large infotainment screen and automatic gear selector, the image shows how the British car maker has shunned the back-to-basics approach of the once-utilitarian off-roader. That said, there are charming details, like the pedals that are stamped ‘STOP’ and ‘GO’ and use of tough-looking black plastics that prove the new Land Rover Defender might still win fans among muddy gumboot wearers. There’s also plenty of stowage space, both above the dash and below, which those who will use the Defender for work will appreciate. It’s not yet known if the Land Rover will offer a manual gearbox with the Defender. On sale in Europe in 2019 but due to touch down in Australia much later in 2020, the long-awaited Defender replacement has been promised by execs to become the “most off-road capable Land Rover vehicle ever”. Developed under the codename L663, the all-new 2020 Defender will ride on a toughened version of the Land Rover D7u aluminium platform, switching from a steel ladder frame to a more car-like monocoque. Set to get the same 48-volt mild-hybrid and plug-in hybrid powertrains as the Range Rover Evoque and the Discovery Sport, the next Defender will be a technological tour-de-force compared to the ancient off-roader it replaces. Later on, Land Rover has promised a pure-electric version will also be offered. Design-wise, Land Rover says the Defender will be a “revolutionary product” and from our first glimpse of the cabin it’s easy to see how the British car-maker plans to broaden the appeal of the agricultural original.